The Hummingbirds are husband-wife team S.G. and Rachel Wood. 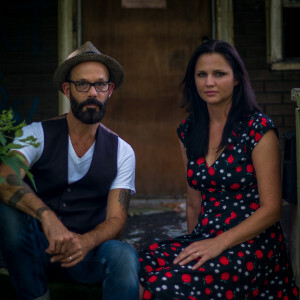 Born and raised in Detroit, now residing in Tampa, their music is both northern and southern Americana, blending both grit, and self reliance with hospitality, and charm. They play old guitars through old amps, bang drums, and even pluck banjos sometimes. Their live stage chemistry and organic duo harmonies immediately captivate and charm audience members while Rachel’s solid command of rhythm guitar, peppered with S.G.’s thoughtful lead work, keep their songs rolling in true Americana form. S.G. and Rachel were fans of classic country music, as well as myriad of other genres when they started their band in the early 2000’s. And while they continue to draw on these influences, what comes out in their own songwriting is a hybrid sound all their own, genuine & playful, earnest & soulful. Their songs twist through tales of loss & heartache, while others whisper sounds of hope, love, and journeys from the road. Their newest album, “13 Days” released in 2015 features 13 songs about rivers & rattlesnakes, the cold & the road, and heartaches & love. Recorded & mixed by Grammy Award winner, Mitch Dane in Nashville, the recording is delivered with a touch of twang and a rootsy, raw, alt-country vibe. The Hummingbirds have two previously released recordings. Their first self-titled release (2005), is a twangy full length album, which includes a track that was placed in the 2009 film “The Horsemen,” starring Dennis Quaid. Their second release came out in 2007, an EP titled “Lonesome,” a blend of old school country, folk, and heavier alt-country songs, recorded with a full band, live at Big Sky Studios in Ann Arbor, Michigan in two quick sessions. Their recordings, along with their live show chemistry has garnered them the favorable attention of fans and music critics alike from Detroit to Tampa, Asheville, to Nashville, and many towns and cities in between. Performances at The Bluebird Café, Nashville, Tennessee/ The Ark, Ann Arbor, Michigan/ The Detroit Hoedown/ The Purple Fiddle, West Virginia/ Satchels, Gainesville, Florida/ Altamont Brewing Company, Asheville, North Carolina/ Ella’s Folk Art Café, Tampa, Florida, and many, many more!